I used to love carving pumpkins on halloween. I don't enjoy the day so much as I didn't really enjoy dressing up (though in my younger years I did.) I enjoy the creativity that others put into their celebrating. The creative jack-o-lanterns, and the creative costumes. I enjoy seeing the creativity of friends, while at the same time, never really feeling like this holiday was my outlet for creativity. Admittedly, I'm too tired to even try this year. We're in the U.S. for 1 year, and we did carve pumpkins, but I didn't give it my full gusto like in past years (where I won contests for creativity). My kids will dress up, but I won't be. I hope I'm not making a mistake and missing out on family memories… but I don't think it'll warp them too much. I'm just not in the mood for halloween, and I'm allowing myself to not be in the mood, because part of this year, is to get some spiritual rest so that we can go back fully rested…. and if I'm tired, it means I need rest. In PNG we don't celebrate Halloween. It never made its way into the culture, and so, for the past 7 years, October 31 comes and goes and no one really even thinks much about it. We don't have big orange pumpkins to carve (our pumpkins are small and green), we don't dress up, we don't trick or treat, we don't put up spooky decorations. For the most part, the day comes and goes and no one even realizes 'oh yeah, in the U.S. it was halloween!'. This year I expected that I would whip out the old carving tools and create a new masterpiece, but because of where we are emotionally, I just didn't have it in me, and I'm fine with that. I'm loving all these pictures I see on Facebook of friends costumes and pumpkins, etc. I'm not into the spooky and creepy stuff, but I like the way halloween has become less of that (in my circles) and more about being silly and creative with family. I'm never really sure what we're celebrating on halloween, some folks say it's the harvest, others say its 'free candy', neither of those things really excite me enough to care about celebrating. But, doing something creative and fun with your kids, that excites me…. unfortunately this year, not enough to get me to engage in any highly involved shenanigans. It'll be a low key, mellow halloween for us this year, but that's okay, because it's more our pace. You can't avoid celebrating Halloween for the past 7 years and then suddenly jump right into it full speed. "Oh, so you work for ......[names omitted to protect from search engine caching] ?" "yes, I do. When I said I only came to the U.S. every 4 years, that is why." "oh great! My husband and I support another missionary with you guys, who goes to China!" That wasn't meant to be a shameless pitch, so much as I prefer to frequent businesses that are missions friendly. Anyway... she diallated my eyes for a test (on that is included in her standard that I've never had done before)... and upon doing so, everything got really blurry. She told me all kinds of things (now that you're 40, you can expect this when you're 50)... etc etc. etc.... told me that when I'm 50 I'll need bifocals, only these days they have this non-bifocally looking thing called 'progressive lens' etc. It struck me that there is a lot of vanity in the area of eye care. I mean, I was standing in front of a shelf of prada eyewear. Anyway, as I sat there trying to kill time reading my phone, (which was too blurry) I tried reflecting on the idea that I wouldn't be in that office for another 2-4 years. Whatever else happens this trip, I got that whole EYE exam thing checked off the list. And that's about as poignant as I got. I didn't have whole lot of time to reflect on much else. I was talking to the staff and enjoying my visit and basically being friendly. I was thinking 'surely there is some huge lesson to be learned in here.' But no one was pushing me more pricey frames... no one was trying to sell me on higher end lenses. So I didn't feel like I normally do when I leave such a place which is 'wow, people really spend a lot of money to look younger, or cooler, or something-er' but I wasn't struck with that this time, so I enjoyed my visit. You may have heard me mention before that serving in PNG, God has used every aspect of my personality and abilities to serve Him, in one for another. You may have heard me say that, part of what I love about serving over there, is that I can see how God designed me for this purpose, and how everything fits together so well. For a few days I've been consulting on some reports and each report that goes out has a score on it. We track 6 elements of things. Today I noticed something while processing the reports BEFORE sending them out. If you read the first letter on the LEFT of each score, it spelled out "SADPOO". I decided to re-arrange the scores so that we didn't somehow subconsciously give everyone a 'sadpoo' report. I chuckled at that, because reading things forwards, backwards, and sideways is always something I have done just to entertain my eyes while I listen to people talk. I often, without meaning to, see a word, then think of how to spell it up, down or backwards. For example, this blog, I would look on the left hand side and see "YPWE FWSDR" in the first 2 paragraphs. I'm not Monk, it just is part of my personality. And I frankly, I never thought it would come in handy before. This little oversight could have been one of those bad jokes you can't shake for a long time. But as I got to think about it, I realize, that I too have a Sad Poo report to give. My wife, and I and my kids are all really down this week. Sad. There's been a LOT of hard things that have come at us in the past 4 months. You already know of many of the losses. This week there are more. Last week, we were told a beloved Cousin has a very short time to live. Our already hurting hearts sunk deeply. Then we were told a friend back in PNG nearly died, though he survived he lost his leg. Our backs felt more burden for our co-laborers in Christ. Then, this weekend, a very dear friend of ours died suddenly from a heart attack. A lump swelled in our throat, tears poured, and our hearts dropped into our socks. Not everything is rosy right now. We are sad, and with grief and sorrow comes exhaustion. We know God is sovereign and good, and we know we've had more than our fair share of good in life. Right now we're looking down a long dark tunnel of pain and hoping there is light soon. If you would join us in prayer, please pray for our spirits to be healed and lifted, for our energy to pick up. We truly had a hard 4 year term and we need this home-assignment to be restful, but it hasn't been. It's been hard. We need it to get better. Would you join us in asking God for that? Would you join us in asking God to console and comfort those who are affected most directly by all of this bad news? We inherited a free refrigerator. We are thankful for it! We purchased a few cheap ice trays and my son has repeatedly told us how frustrating doing his chore of keeping the ice bin full, has been for him. I tried the trays, he was right. WE LOVE ICE. In PNG ice is awesome! We use a lot of it. We have a tradition, whenever friends come in from the village, we invite them over for a meal, and make sure to have PLENTY of ice because they can't get ice in the Village. They've been living for weeks off of no refrigeration at all. Refrigeration is a wonderful thing. I got home later that day to find my wife and daughter had discovered an ice maker way down in the back. So, I went about installing the ice maker water feed line. Now in PNG, plumbing is a hassle. Odds are you're dealing with at least three different types of standards and material. U.S. vs Australian, pvc vs flexible pipe vs copper vs steel. You never know until you begin if the thread count is going to be the same, if the part you need will be in PNG or even exist! You have to be patient and creative, and find ways around leaks, or have money to tear it ALL out and start new. I HATE plumbing in PNG, it requires every ounce of patience I have, and it is expensive. But, in the U.S.... ooh la la. (pardon my French)!! I went to the hardware store, found everything I needed, all labelled clearly, all with clear instructions, all standard sizes such that I only needed 1 wrench, etc. Within minutes the job was done, and done right the first time! SAY WHAT? The first time! That never happens to me in PNG. Always something goes wrong 1/2 way through the project. Nope... everything went right together, I had prepped for leaks, explosions of water, etc... turned on the main.. and... huh? It just worked. It worked! Now I know... I know it wasn't me. All these years all my plumbing difficulties... it wasn't me! It wasn't some massive lack of understanding, some missing piece of information. It was the absolute craziness of not having a plumbing standard and people just doing whatever worked. I mean I've seen PVC joined to Flexible Polyethyline pipe by melting it on with a blow torch. 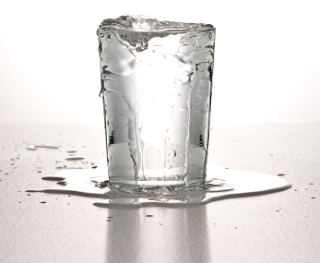 Silicon is your friend when it comes to water proofing something... but caking it on? and now, we have automatic ice happening while I write this. No muss, no fuss. No more problematic trays. 3rd World Problem: - we have no water coming into our house because the tanks rusted out. 1st World Problem: - I can't fit my automated ice cub into the hole for my Sports Travel Water Bottle because they're too big. Everybody could use some well timed encouragement. John 13:35 says the whole world will know we are Christ's disciples, if we show love to one another. Encouragement is a great way to show love! More often than not, we're accustomed to point out flaws, or make corrections. We can often forget that just a little bit of encouragement can go a long way. Back when I was single my roommate Mark and I, who also worked together, would take the same route to work. Every day we'd stop at the same intersection and every day (school season) there was a middle aged to older female crossing guard sitting in a lawn chair. Mark and I took to passing the time spent at the stop light, imagining stories about her. Every day the story was different. Some days she was a super hero, and other days she was serving some sort of community service. We took to waving at her each day, but she never waved back. At first we thought it was because she didn't see us, so we would both wave vigorously. Still no wave back. Day after day, she wouldn't wave, but we would wave at her. Day after day we made up stories about how she wound up there, but always told with respect. (I kind of have this thing about respecting public servants). After a month or so of this, we had the idea to encourage her. So we got a few candies, some treats, and a greeting card. 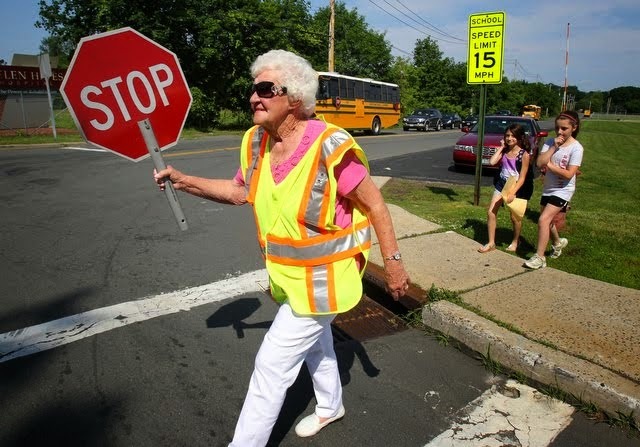 "Dear Crossing Guard, we respect what you do, thank you for keeping our community children safe. We think you are awesome! We hope you have a great day! - Signed - the two guys in the truck who wave at you every day." The next day, we came to the intersection armed with our paper bag of goodies, and I shouted "go go go go go" and Mark jumped out of the passenger seat, rushed over to the lady sitting at the stop light, handed her the bag, said something nice to her, and rushed back to the truck. The light turned green and off we went. We hoped it would encourage her. The next day, when we got to the intersection, we looked over and she stood up, and gave us a big wave! We waved back and laughed and smiled. It was awesome. She must have been waiting there for us, sifting through all the cars visually, waiting to see if we'd come that day. We were greatly encouraged that she received our encouragement so well. Every day after that she waved to us, and gave us a big smile. We had made a human connection, with someone you pass on the street. And it came because of this little idea that maybe she could use some encouragement. It doesn't take much. The smallest act of random kindness can start you on a path of adventure you never thought would happen to you. If you think your life lacks adventure, then spice it up a little. In my line of work, I hear this a lot "your life must have so much adventure! We live normal boring lives, but you… the things you must have seen!" My response to that is, "my life was full of adventure before I ever left for PNG." I was always looking for creative ways to encourage people. I could tell you story after story of things we do to make people smile and laugh. Go get you some adventure! Encourage someone today. Today as I was out driving, I saw a man walking down the street wearing a black hoodie that read in big letters "FILTHY". He walked with a bit of a swagger, and I had to wonder what series of lies he had to have bought into to wear that sweatshirt. Maybe it was a band name and I'm over thinking it. My creative mind started to concoct a video in which people walk around wearing on their chest the condition of their hearts. There were black sweatshirtted people with "FILTHY" and white sweatshirted people with "FORGIVEN" walking all over. The white shirted folks if they cringed from the black while passing them, they would examine their sweatshirts to be sure they didn't get any of the darkness on them. But the ones who stopped to talk and help the black shirted ones, suddenly found that the light spread more easily than the dark. To see that young man walk around, proud of his filth, I had to wonder if somehow, in his life, someone had sold him a bunch of lies regarding his own worth. I think there are a lot of people walking around this earth in precious need of God's forgiveness, and when I see something like that, it stands out as such a symbollic image to me and a reminder to do more. So I got this idea to install a solar power inverter with battery backup for my house in PNG. I spoke with several knowledgeable people, and even waited until a neighbor tried it out, to analyze his results. The short version of the story is... WOW. this works. -it's expensive. My calculations put a price tag of $28,720 on it. That includes all equipment, shipping costs, and installation costs. Because we're just under the equator, what they call 'grid parity' is high. Meaning, the money we save each month, compared to the cost of the installation will come to 0 in around 40 months. (a little over 3 years). THIS system would pay itself off in 3 years. AFTER 3 years our electricity would be free. This means, that for the original investment of $28,720... after 40 months, we would have a reduction in our monthly costs of living by $300. It's a no brainer. Even if we're not in PNG after 4-5 years, whoever is in that house will be able to use the system. The panels are gauranteed for 10 years (and will likely live much longer). So the question is "why don't I just do it?" Well to afford it, I would have to go into major credit card debt and I don't believe in that. Further, we live on support from individuals and I though I feel this project is the wise thing to do from the perspective of a steward, and a living member on the planet, it is a LOT of capital. -when I came to the U.S. I investigated crowd-funding. Kickstarter turned me down. I'm currently using GoFundMe to see if they'll approve my project. I can't say this enough.... this is such an obviously wise use of resources, that I have to find a way to get this done. THE EASIEST way would be to raise separate funds for this, the hardest way would be to go into debt for this. It is like printing money not only for me, but for future missionaries living here in this house. I spoke with a friend of mine who deals with loans in this area of technology, and PNG has a very high grid parity. Most banks who give loans would consider it a 'yes' (but the banks who give loans don't give to PNG). So, here I am, trying to raise funds for this. $8720 - outback battery system, with batteries and shipping and duty. If you're interested in the technology or contributing towards this project, please contact me. the donation would be tax-deductible, and really cool. As a contributor, I will be sure to send you pictures of the installation as well as put an inscribed plaque on the roof with your name on it... so that people in the future would know who to thank for the fact that their computer equipment doesn't catch on fire (yes that has actually happened), and they have avoided the cost of living increases that come with an ever rising cost in power! Let's get this done together! My wife and the kids went shopping and picked up some frozen Eggo Waffles. dad: "Hey family! We have eggos!!!" Not sure if this is a missionary kid thing, or just that our kids have cheap parents. and they've never really been exposed to TV commercials... so "leggo my eggo" is not in their vernacular. I'll give you a ride.' I didn't do it. a nice adult offers to help keep kids safe. In USA - I was that creepy stranger danger that parents warn you about. little pull was there to help, and I chuckled at myself. I'm not a bumper sticker guy, I don't wear t-shirts. I get that people share parts of their personality via these mediums, I never have. Recently, wherever I go, I'm joining a wifi on my iPhone. And man there is a list of dozens of wifi networks to choose from. 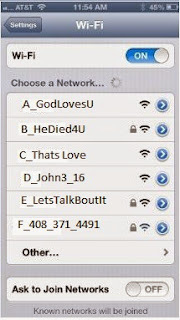 These days you have to tell people your SSID as well as the wifi password to join. Back in PNG and in my day, you didn't have to say the SSID, because there was only 1 in range. since your neighbors are all forced to scroll down this long list of wifi SSID's why not take a cheap wifi device that handles Multi-SSID, and make a message out of the SSID's? or something to get around it. But still, it struck me as a yet-unused-medium that one might express oneself through. If you live in the Colorado Springs, Castle Rock area, you need to check out this awesome church. Pathmaker's Church. We were privileged to share this this weekend, and it was awesome. The people were so welcoming and enthusiastic. We had an absolutely awesome trip to Colorado, and we definitely have to come back. We saw old friends and made new ones. We honestly feel that this weekend God allowed us to be a part of something awesome that He is doing in Castle Rock, Colorado. CHECK THEM OUT! God is really doing something there, and we're totally blessed to have come across it the way we did and stoked to be praying for their future. I've talked a bit on this blog about saying 'goodbye' and the hole it leaves in the heart. Today I want to talk about saying 'hello' to old friends whom you haven't seen in a while. It fascinates me how God made us. Sometimes you can not know how much you miss a person until you see them. Then suddenly when you see them, your heart fills overjoyed and full just seeing their face. The more I age the more I become convinced of the fact that God moves through people and relationships. It is an uncanny little miracle to me, that simply walking through a door, and seeing a face that your heart suddenly feels like bursting with joy. Every moment with that person or people fills like your heart is filling up, and overflowing. Sometimes it is people you've been missing for a long time, and are anticipating a grand reunion. But other times, it's just old friends that you have gotten used to not seeing, and then when you see them again, you're ambushed by how happy it makes you. The impact of it is so strong that I'm always taken by surprise. After a visit with such people, friends, family, whomever it is, you may completely forget all the details of the conversations you had, but your heart retains the memory of their presence. For days, weeks, and even years afterwards I might stop and think 'wow that was SO good to see them again.' Just the memory of it, can fill you up a little bit again. It's like being hungry and not knowing you're hungry until you taste some really good fruit or something and you realize it tastes so good because you haven't had it in a while. The hunger increases the flavor. But with your heart and people. 1 - I would never be able to see God's face in human form. I think my heart would literally explode at the joy it would bring. I suspect my soul hungers for him much deeper than I realize. 2 - When I do get to see my Savior face to face, it's going to be more joy than I can currently comprehend. And I can currently comprehend a lot of joy. The idea of eternity used to boggle me, and even make me a bit anxious. But these little reunions with friends, bring me peace about it, and remind me 'heaven is going to be SO awesome!'. the following is courtesy Adam Boyd's Blog. 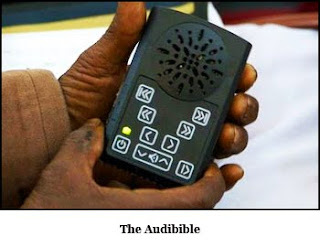 When we launch the book of Mark and Abraham Story in Enga the week of October 12, our primary focus will be distribution through solar-powered audio players called Audibibles. Most Engans (and Papua New Guineans for that matter) have never learned how to read in their own language, and often they are not interested in learning because reading is not a strong part of the culture. So if you hand an Engan a printed Bible in their own language, they will likely never read it. If you hand them an Audibible, however, they will listen to it over and over, as will most everybody else who lives in their village. In the oral cultures of Papua New Guinea, audio recordings are the best way to share God's Word. And when the battery runs out, they can just put the Audibible out in the sunlight to charge! In addition to the Audibible, Enga will also be one of the first languages in Papua New Guinea and the world to have a smart phone app. The smart phone app highlights the text of the Scripture sentence-by-sentence as the audio recording plays. We have found that the same people who would never read a printed Bible will immediatley engage with the Enga Bible App and try to read along with the recording. (Engans love technology!) And those who have learned to read in English or Tok Pisin can fairly easily transfer those skills over to Enga with a little practice. So the Enga Bible app not only gives people the Word of God in their own language, but it also teaches them how to read. Some of you may be thinking, "What good is a smart phone app for people who have no electricity?" Good question! The reality, however, is that even people who live in remote villages without electricity often have cell phones, and they find all sorts of creative ways to charge them. Smart phones are just now reaching the price range ($35) where the average Papua New Guinean can purchase them. We have gone to villages in Enga where there was no electricity only to be shocked to find the villagers taking video of us with their smart phones! 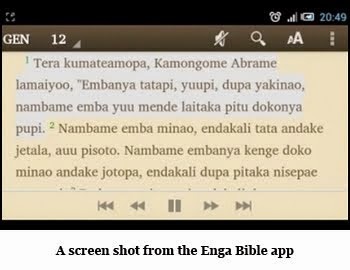 While the Audibible is still going to be the most popular way of accessing Scriptures right now, the Enga Bible App is sure to take off in the near future, especially among Engans who live in town. The best part is that the app is free and can be transmitted for free from one person to another. It would not be at all surprising to share the Enga Bible App with one person and come back a week later and find that all of his friends and family now also had the app. Papua New Guineans are good at sharing media on their phones! Click here to see a video of how the Enga Bible App works. We will also have printed versions of the book of Mark and the Abraham Story available in Enga printed side-by-side with the Contemporary English Version (by permission of course). So those Engans who do want to read the printed Word will also have access. Please keep the upcoming launch of Mark and the Abraham Story in your prayers. We are hoping to distribute in four different locations from October 12 to October 16. Pray that many Engans will come and receive God's Word in their own language. Pray also for the team from Newbreak Church near San Diego that is coming to participate in the distribution. We look forward to sharing with you next month about how it all goes!